My oldest child is turning 9 in three months, which means I’ve been changing diapers … for too long!. My toddler, Skylar, still is not potty trained yet (he tries, but isn’t there yet). So, his room is stocked with wipes, as well as diapers and pull-up training diapers. He’s got very sensitive skin, as did his sister and brother before him, so I’ve always tried to buy brands that won’t irritate them. Enter WaterWipes — this is a brand that a mom can really get “behind”, as they’re made with 99.9% water and 0.01% grapefruit seed extract. We were recently sent some to test out and I really like how gentle they are. They even feel different from other brands. I watch what foods my children eat, I make sure I use “safe” sunscreen — so it makes sense to care about what’s in the baby wipes that I use on my children’s skin. This weekend, we went to Manhattan with the kids. Our destination was brunch and a trip to the Children’s Museum of Manhattan. We always take wipes with us when we’re on the go, for washing little hands and faces — as well as diaper changes for my toddler, Skylar. We headed in at 11 am to have a delicious brunch at Big Daddy’s on the Upper West Side. Besides diapers, changes of clothes and assorted toys, we took a package of WaterWipes with us. We stopped in at Big Daddy’s on 91st and Broadway for some pancakes and omelettes. Little faces always get dirty when you have banana chocolate chip pancakes! I am happy that the pancakes were a hit and my kids actually ate them (my little guy has been really, really picky lately). But he devoured the ones from Big Daddy’s. I easily cleaned my little guy ‘s sticky fingers and face with WaterWipes. He’s in full toddler tantrum mode these days, so it was easier to clean his face and hands at the table, rather than take him downstairs to the restaurant’s restroom. My husband cleaned up my oldest child’s face. We have a real thing about clean hands and faces, so I’m glad we had WaterWipes right at our fingertips. It was good to know that I wasn’t going to put any chemicals on their faces or bodies, just water and a little grapefruit seed extract. My daughter used to have very sensitive skin when she was a baby, so I couldn’t have put any baby wipe on her face (even the “sensitive ones”). We used only no-dyes soap and water on her. After a delicious meal, we headed to the Children’s Museum of Manhattan. The Children’s Museum of Manhattan was so much fun! We had only been there once before and hadn’t seen the whole place before. Then we found Messy Art! My daughter had a blast, but even after I cleaned her up (in the sink they had right there), I kept finding blue paint on her. I kept pulling out the WaterWipes to clean her up. 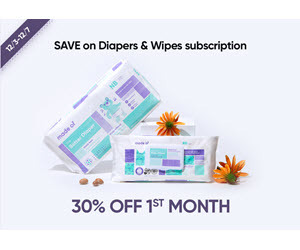 WaterWipes can be used for newborns on. Did you know that the skin of newborns is 5 times thinner than an adults? While diapers are included in your hospital stay, there is no containers of wet wipes. When my first child was born in late 2005, I had no idea about this. I was given a plastic basin and a container of DRY wipes. to get the job done. And of course, being my first diaper change ever, I didn’t do such a great job. I wished that there was something that could clean my newborn’s delicate skin at my fingertips. WaterWipes would have been amazing to use in his newborn days – Maternity Wards and Neonatal Intensive Care Units in the UK and Ireland have started using WaterWipes and recommending them to parents. WaterWipes only contain 99.9% purified water and 0.01% grapefruit seed extract. You really can’t find anything gentler is a wet wipe. WaterWipes are the only baby wipe ever to be approved by Allergy UK. Buy WaterWipes on Amazon.com or enter your zip code here to find a store close to you (in NYC, find them at Walgreen’s). You can also find them online at Target.com, Drugstore.com and many other stores. We are giving away a case (12 packages) of WaterWipes. I would love to try this. We have a child that has very sensitive skin! I am having my first baby soon and I want to provide him with the safest and most natural resources! I’ve read about these and am excited to try them out! I do have a child with sensitive skin so I would love to try these. This mom of 5 needs these!!!!! Would love to try these for my kids. They are MESSY! And my daughter is really sensitive so these look perfect. My son have very sensitive skin and I think this product would work great for him. I’d Like To Try These Because It Looks Like A Safe, Effective Product. I Like That It Does Not Contain Harsh Chemicals.